Thai Folding Pillows are kinder on your tush. A stitched cushion panel offers a soft padding while the sturdy King Size Pillow props up your back. The handy cushion panel adds extra comfort when sitting on the floor and folds away conveniently when sprucing up the house. 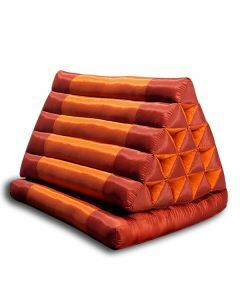 Thai Folding Pillows are a mainstay in Thai households, due to their convenient portability and comfort. H: 14", W: 22.5", L: 33"